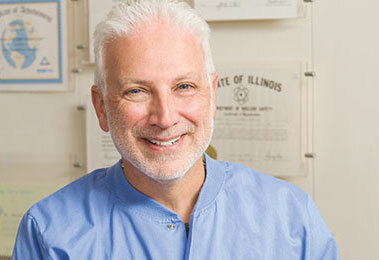 Porcelain Crowns / Bridges - Chicago | Benjamin S. Fiss, D.D.S. A crown is a full coverage restoration that is placed on a tooth to restore cosmetics and function. It is needed when severe breakdown due to fracture or decay in excess of two-thirds of the tooth is present. Crowns are also used to restore teeth that have previously had root canal or endodontic treatment. Years ago, dental crowns were only made of gold, providing strength but very poor cosmetics. Today, there is a wide selection of materials to choose from. The factors, which affect material selection, are the tooth location and forces of occlusion or the force of chewing the crown is to endure. Most cosmetic crowns are made from pressable ceramics. No metal is used, therefore, making this ideal for front teeth. Patients will no longer see gray or black lines at the gum line. Without metal, the natural translucency and light reflection of the porcelain create a life-like, beautiful smile. 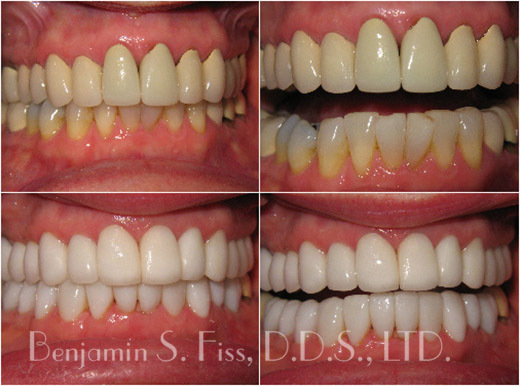 In the posterior areas of the mouth or in patients who exhibit problems with their bite or occlusion, there are several variations of porcelain fused to gold crowns. 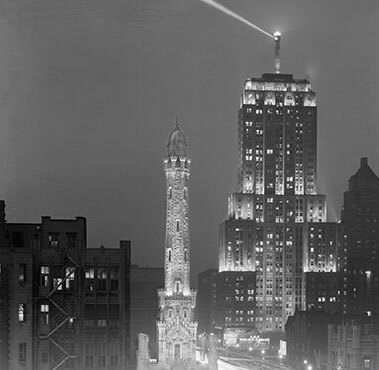 These are beautiful restorations needed for strength in areas where translucency is not an important factor. Porcelain Crowns last an average of ten to 15 years, through constant home care and maintenance of the patient. When patients are missing one or more teeth and the placement of dental implants has been ruled out or postponed, teeth can be replaced using different forms of prosthetic dentistry. Partials and dentures are removable appliances replacing some or all teeth. They are made of acrylic or combinations of metal with acrylic. Wearing something removable can compromise speech, cosmetics, and eating certain foods. With adjustments and some time to acclimate, patient acceptance is usually very good. A more permanent solution is fixed bridgework. A bridge consists of at least two natural teeth which have been reduced to accept a crown. These two crowns are connected by the pontic or missing tooth. Bridges can be various lengths depending on the number of natural teeth supporting it. A bridge resembles natural teeth in cosmetics and function, but because they are all connected, flossing and home care for the patient may be difficult. 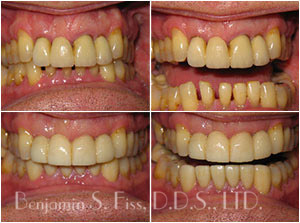 Patients with prosthetic dentistry should visit for regular cleanings three to four times a year to prevent failure. 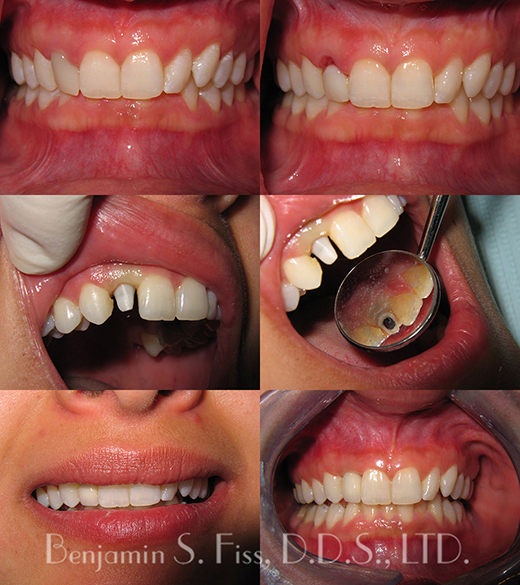 Two three unit bridges were replaced from porcelain to metal (dark at the gumline to all porcelain bridges) giving the patient a youthful smile.